‘We don’t see any good will come the Syrian side. 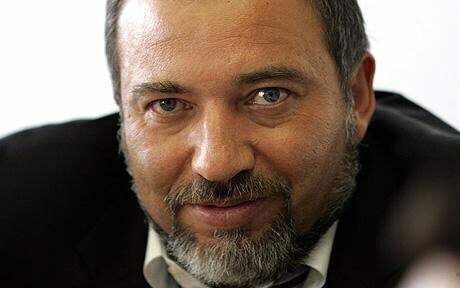 Only the threats like: ‘If you’re not ready to talk, we’ll retake the Golan by military action’,’ Lieberman said…..
….The Jerusalem Post said Lieberman would not say whether he ruled out or accepted the concept of a Palestinian state. “…Regarding Israel’s borders, Netanyahu says he plans on keeping 50% of the West Bank, including the Jordan Valley. The prime minister also says he is willing to adopt the two-state solution but demands restrictions be imposed upon any future Palestinian state. Among other things his government is demanding control of the Palestinian state’s airspace as well as its border crossings, and the power to limit its relations with countries such as Iran. Progress on establishing a Palestinian state must go “hand-in-hand” with efforts to stem Iranian influence in the Middle East, Secretary of State Hillary Rodham Clinton said yesterday, implicitly rejecting the emerging position of the new Israeli government. Daniel Kurtzer: I would be a little bit cautious regarding what seems to be the new vogue in peace-process thinking that substitutes the traditional thinking about “land for peace” with the idea of “land for strategic realignment.” The situation in Region ‘Looks Pretty Dreary’. LOS ANGELES, Apr. 24 — Iraq and Syria, following broad-ranging talks between Iraqi Prime Minister Nuri Al-Maliki and his Syrian counterpart Mohammed Naji Otri, have agreed on a new plan to repair the bomb-damaged Kirkuk-Banias oil pipeline. “Discussions led to a strategic agreement in the areas of oil, gas, power, and trade,” said Al-Maliki, adding, “The two sides also reached agreement on repairing the pipeline across Syria.” “We have a timeline set for work on the pipeline, which will expand our oil export options. Our oil export volumes so far have been unacceptable,” said Iraqi Deputy Premier for Economic Affairs Barham Ahmed Saleh. Stroytransgaz eventually signed a protocol with Iraq to reactivate the line, but Iraqi officials recently said the work had not been undertaken. “The Russian company failed to do the job and now we are seeking other foreign firms to evaluate the damage and rebuild the pipeline,” said a spokesman for the Iraqi oil ministry on Apr. 21. Iraq is seeking to upgrade and expand all of its oil export infrastructure in order for it to handle projected output increases. Under a plan announced in March, current Iraqi production of 2.4 million b/d would be increased to 2.9 million b/d by yearend 2009 and to 6-8 million b/d by 2013. Earlier this month, a senior Iraqi official said his country was seeking to increase its oil exports through the construction of two pipelines to Jordan (OGJ Online, Apr. 17, 2009). European and American delegations have held high-level talks with Bashar Al-Assad and members of the Syrian government over the past two weeks. First to arrive was a British delegation led by Bill Rammell, minister of state for foreign and commonwealth affairs. Then a US congressional delegation led by Democratic representative Stephen Lynch showed up. Spain’s Foreign Minister Miguel Angel Moratinos and Italy’s Foreign Minister Franco Frattini followed. As expected, the talks focussed on Syria’s relations with Lebanon, Iran, as well as future talks with Israel. The visitors voiced cautious optimism about Syria’s foreign policy. The Italian foreign minister said that Syria is a country with certain clout in the Middle East as well as a considerable political, social and cultural role. He praised Damascus for opening up to dialogue with the outside world and urged it to help consolidate stability and security in the region. The British minister said that he sensed a positive change on Syria’s part but added that his government still disagrees with Damascus on certain issues. He added that the UK is interested in maintaining good ties with the Syrian government and in keeping the dialogue going. British Foreign Office Spokesman John Wilkes said that the talks were held in an atmosphere of “goodwill” and that the UK was interested in Syria’s point of view. Mostly, the European delegations seemed interested in finding out how far the Syrians were ready to help disentangle regional problems. And their tone mostly reflected that of French President Nicolas Sarkozy, who advises dialogue rather than isolation and threats. Europe seems to be pleased with the flexibility Syria has shown on more than one front. Damascus has initiated indirect talks with Israel, monitored closely its borders, and talked to the Iraqi government, and generally treated Lebanon with respect. Europe would like to see Damascus do more; for example, distance itself from Iran and rein in militant Palestinian and Lebanese groups. …..
Damascus seems to be getting the message. It has, for example, brought down the pitch of its rhetoric to a point close to that of moderate Arab countries. But as Europe asks for more, Damascus may not be in a hurry to oblige. Before giving up their bargaining chips, the Syrians want to make sure of what they’ll be getting in return. JIhad Makdisi, Spokesman of the Syrian Embassy in London, explains that an official US diplomatic presence at the National Day Celebrations is good news for the normalization of relations between the two countries that have been at dagers’ drawn ever since the US decided to invade Iraq and transform the Middle East some 8 years ago. Also, Abdelnour pulishes photos of the Washington reception for National Day. “Although we most appreciate some of the statements he made, nothing was accomplished. The U.S. simply has not pushed enough,” the prince said. He said he was hopeful that Obama is going in the right direction, but warned that all of his beautiful speeches would come to nothing unless he acted on them, and quickly. ….”Bush had turned his back to peace in the Middle East and almost abandoned all that Clinton had done. The Crown Prince sent him a letter stating that we were coming to a crossroads and either we go together in the road that we choose or we go our separate ways,” he said. Eventually, they came together and established what Prince Turki described as a preferable institutional dialogue, rather than being subject to the “whim and will” of two heads of state. He argued that American use of pilotless aircraft in Pakistan should be stopped, as it only galvanizes anti-terrorist sentiments there. “People blame Pakistan for the Taliban, but they forget that Pakistan is a victim of those same terrorists,” he said. For Syria, where leaders have indicated a willingness to talk, he urged Obama to get on with it. He said Obama seemed to be following the right policy in Afghanistan by going after terrorists there, but he urged him to be even more aggressive in soliciting support from other nations around the world, and to pull out as soon as victory was achieved. And in Iraq, he said it is vital that a U.N. Security Council resolution be passed to guarantee its territorial stability before total troop withdrawal, to prevent civil wars from breaking out and sucking the entire Arab world into a conflict it doesn’t want. He also had some advice for Hamas: Follow the examples of Mahatma Ghandi and Martin Luther King Jr., who used civil disobedience to achieve their objectives. 1. Elections 2009. The view from Washington is that while the Administration wants March 14 to win, they think Michel Sleiman wants a stalemate, with independent candidates holding the balance. The best informed US officials have noted the absence of violence, so far. They believe that is because both sides expect to win. Should either side [especially the Opposition] feels it is going to lose, Washington Officialdom believes that violence will erupt prior to the election. 2. There also has developed something of a split between the US and France with regard to Lebanon. With Chirac gone, the “tilt” towards Hariri has gone as well. US officials say the French would like to see the “balance” created by Doha to be continued and enhanced. They, however, are quietly pleased with themselves that they have been able to keep the tilt towards the government despite the change in Administrations in Washington. 3. Israel. Not much importance is given to Bibi Natenyahu’s call for the Arabs to accept a Jewish state. It’s like his latest idea that nothing can be done on the Palestinian issue until Iran is solved. It’s Bibi being too clever by half. He will back down on both, especially if, as expected in Washington, the Administration will play it just a little bit tough. 4. Lieberman, is a very important player [unless and until he is indicted]. He is a member of the inner Cabinet of 5 (considering the full Cabinet has over 30 members, the largest in Israeli history). Barak is also one of the five and the Administration consider it to be an excellent political pairing with Bibi for a US audience. Lebanon – Bucking the trend: A surprising economic success amid the usual political gridlock. ….Lebanon’s GDP grew during 2008, not at an annual rate of 7.5%, it seems, but at 9% or better. Yet even that trend-bucking number looks modest compared to other milestones scored by this small, almost comically turbulent country. Last year the value of deposits in Lebanese commercial banks rose by 15% to an impressive $94 billion, equal to 327% of GDP. Industrial exports surged 24%. Tax revenues, tourist arrivals, banking profits and the number of construction permits all soared by a third or more. A giant 46% leap in net capital inflows helped Lebanon post a record $3.5 billion surplus in its balance of payments, and boosted the Banque du Liban’s own reserves to a cosy $22 billion, nearly double its holdings a year ago. Nor does this upswing show much sign of slowing. Sales of new cars are up by 19%, and the number of tourists arriving in the country in the first three months of this year increased by 50% compared with the same period last year. Security forces arrested on Saturday a cell linked to the Israeli Mossad in southern Lebanon, Future News TV reported. The TV station said police arrested three members of the cell during raids in Jezzine, Nabatiyeh and Sidon. Voice of Lebanon radio said, however, that security forces arrested a suspect named Ali Mantash in Nabatiyeh and a Palestinian whose family name is Awad in Sidon. It added that authorities were still looking for the third suspect. A source also told Kuwait News Agency (KUNA) that one of those arrested is Ibrahim Awad, the cousin of Abdul Rahman Awad, the successor of Fatah al-Islam leader Shaker Abssi. Former security services officer Brigadier General Adib al-Alam, his wife Hayat Saloumi and nephew Joseph Semaan al-Alam — also a security official – were charged on Thursday with spying for Israel. They are accused of informing Israel about Lebanese and Syrian military and civilian sites with the aim of facilitating Israeli attacks. The retired general told interrogators he had worked for Israel for more than 10 years and regularly met with his Israeli contacts at European destinations. Generally speaking it is a well balanced post except for the picture. What kind of pervert is this who thinks he can bomb the high dam? I heard he is not going to Egypt either. You gotta give him credit, at least he’s trying. Trying to divert attention away from Israel, that is. It’s always been the Iranians. Even when it wasn’t the Iranians (such as during the first 30 years of Israel’s existence). And if tomorrow it won’t be the Iranians, it’ll be Pakistan and Afghanistan. Actually, it’s already them. Lieberman said Iran isn’t Israel’s biggest threat, Pakistan and Afghanistan are. And when it’s not them, it’ll be India, or Vietnam, or China. He’ll go around the world until he gets back here, and then he’ll come up with something else. Just not Israel. Nah, we’ve been ready to give back the West Bank since day one… We’re building settlements to house future Palestinians. Heck, Lieberman’s own home will one day welcome its rightful Palestinian owners. And they’re so damn unthankful! Bloody bastards. Maybe we’ll do a curfew tonight. For 12 hours. No, 24 hours. Wait, Independence Day is coming up (Wednesday). So from now until after the celebrations. Heck, AP, you don’t even buy his crap, do you? Do I think that we Jews have the right to “reconquesta” holy-land? Holy-land is the essence and the core of Judaism. if I lost My right arm” .. ? in the last 130 years? (or 2100 years..? depends whom you ask…). Am I a religious person? No no and no..!! watches us from the skies, and judges our deeds. the most fascinating ethnographic documents ever written. Did I (this time) answered your questions? Personally, I don’t have a problem with “Reconquista”. Fine, we felt this land “belonged to us” (for some reason, belonging to us more than to others), so we came here, fought our way through, and created a state. Fine, that’s fact, and it ain’t about to change tomorrow morning. I accept that Israel “reconquered” this land, including the West Bank, Gaza, and the Golan. But here’s my question – if we conquered this land, and if we feel it belongs to us, then I think logically we have one of two choices: Either kick the non-deserved-ones out, or incorporate them into our new kingdom. I have yet to find anyone suggest a good way to “kick out” 4 million people. Will they leave willingly? How much more miserable can we make their lives, before they pack up and go? I don’t know. Do you? But if we can’t make 4 million people board the next train out, or really-big-ship, or many many camels, or whatever, then isn’t our only other choice to incorporate them into our re-created Kingdom of Israel? Can we truly keep so many people under our rule with a not-here-and-not-there status? Let’s make them all Israelis, give them equal rights (because we’re a democracy), and end everyone’s misery, including our own. If Lieberman is right, and the problem isn’t the Israelis or the Palestinians, then what’s the problem, let’s make them Israelis. Let’s decide once and for all – if the West Bank is ours, then so our the people in it. If not, then what are we doing there? What do you say? What’s going on in this world? Lieberman’s ready to talk to Syria (no preconditions), Barak feels we must, and Ahmedinejad’s ready to recognize Israel if the Palestinians do (ABC interview). Have these three just come back from Mexico-City? Really liked the Economit’s article on the performance of the Lebanese economy in 08 and pushing into 09. These are some impressive numbers. Nshalla, the election will run smoothly, so the country continues on its economic success march. There’s still much to do. Now, on the peace negotiations, with Bibi & Avigdor in charge, unfortunately it’s hard to believe that there will be much movement. All they’ll do is kill time, while making some conciliatory statements to please the new administration, and that’s really sad. Let’s say that in your interpretation of Judaism there is justification to waging unprovoked war against the current non-Jews inhabitants of Israel. You are of course aware that anybody can come with quasi-religious claims, such as the one you just made, and thus every group could say that it has justification in waging war and ethnic cleansing against any other group. In what way is your position here different from Wahabism or even Nazism? The Nazi group also had a revelation about the preferred nature of the world, and it contained a little problem with another group that stood in the way of true self-determination for the Nazis. So they removed them. Christians all around the world sing praise songs for the land of Jesus. Should they also gang up for another crusade so that they can have Christian self-determination in their holy-land? I’m not asking you to conceal who you are, just be aware of who you are. You are a Judeo-Nazi. You believe that one group has the right to cleanse another group. However, as an Israeli, you need to ask yourself how you’re going to fool the world into believing that your really representing a humanistic and democratic ideology.